May buy 1 for yourself and 4 additional as gifts. May redeem 1 voucher per home. Single story installations only. Two-story homes cost an additional $50. Service area is from Weber County to Salt Lake County. Customer provides lights, clips, and extension cords. Kringles Christmas Lights provides the staples and installation only. Light removal costs extra. Valid through: Nov 25, 2015. See the terms that apply to all deals. Enjoy beautiful Christmas lights without the risk and hassle of hanging them yourself! Kringles Christmas Lights will string up lights on your home or trees and shrubs. They will also remove the lights for an additional fee; call for more information. 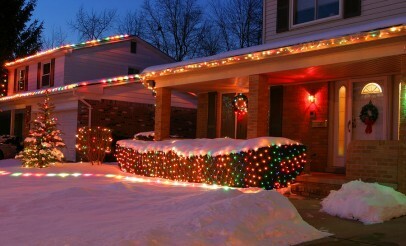 Kringles Christmas Lights have a variety of options for your Christmas light installation and removal needs. They decorate homes, businesses, trees, bushes and more! Kringles Christmas Lights are able to string up Christmas lights on single, double, and three story homes.